Airomir is a device used to treat the symptoms of asthma. Asthma is a condition which affects the lungs and causes the airways to become irritated and sensitive, and will tighten and inflame as a result. This makes breathing very difficult, and can be life threatening for some people. Asthma is a long term condition which needs a long term treatment plan to keep flare ups under control. 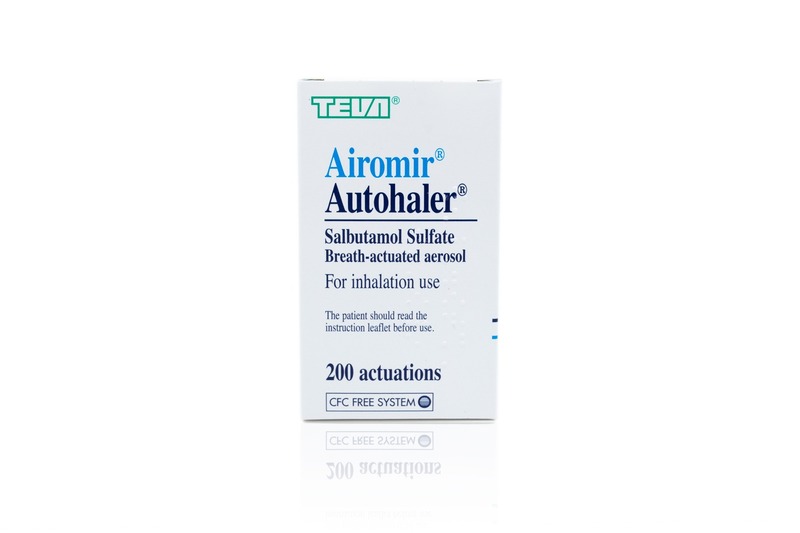 Airomir is a reliever inhaler which means it treats symptoms as they occur. It is an inhaler that contains salbutamol which opens up the airways to relieve wheezing, coughing, and breathlessness. It helps calm flare ups of asthma particularly after exercise, or can help to prevent an asthma flare up if you know your triggers. Airomir is a prescription only medication and should be discussed with a doctor before taking. Doctor-4-U can determine your suitability for this method of treatment. Airomir contains the active ingredient, salbutamol, which works by relaxing the muscles in the airways to make breathing easier. It does this by stimulating the beta 2 receptors which causes the relaxation of the muscles to open up the airways and relieve the symptoms of asthma. Airomir is used when the symptoms occur and is not supposed to be used daily. Daily inhalers are known as preventer inhalers and are used everyday even if you’re not experiencing symptoms. If you feel that you’re using you reliever inhaler frequently or more than 3 times a week you may need a preventer inhaler. You should always follow the guidelines given by your doctor and the patient information leaflet whether you’ve used an inhaler before or not. When using a new inhaler you should shake it and release four puffs into the air. Shake the inhaler vigorously before use and hold it close to your mouth. Before putting the mouthpiece in your mouth breathe out gently then place it in your mouth. Breathe in through your mouth slowly and deeply and press down on the inhaler to release one puff. You should then hold your breath for 10 seconds and breathe out slowly. It’s recommended that adults should take one puff to relieve symptoms of asthma and increase this to two if needed, and if exercise triggers your asthma you should take two puffs of your inhaler before exercising. Wait four hours in between doses and do not exceed the maximum dose of eight puffs in 24 hours. Who is Airomir suitable for? Airomir is suitable for those who suffer from asthma occasionally and when they are exposed to triggers such as pollen, dust mites, exercise, stress, or some medication. When symptoms occur Airomir is used to control the flare up of asthma. Who is Airomir not suitable for? Some medications or existing health conditions might mean that you’re unsuitable to use this type of medication. This may be due to interactions between medications or this medication may worsen other health conditions. Based on your current situation and medical history our online doctors will be able to determine your suitability and you should always consult a doctor before taking this medication. If you’re pregnant, thinking of becoming pregnant, or are breastfeeding, speak to a doctor about whether you can take Airomir to treat your asthma. Can you use Airomir while pregnant? You will still need to control your symptoms of asthma while pregnant, however, you should speak to your doctor about the best method of this that is safe for you and your baby. Guidelines do not specify whether it is safe or not to use Airomir while pregnant as this is based on a doctor’s recommendation for individual cases. If you’re having asthma attacks regularly and find that you’re using your reliever inhaler more than 3 times a week you may have acute asthma and Airomir may not be the most suitable treatment. Severe asthma may need to be treated with a preventer inhaler containing steroid medication or steroid tablets. If you’re allergic to salbutamol or any other ingredient in Airomir you will not be suitable to use this medication. Discuss with your doctor whether any medicines can be taken with Airomir or whether you need to take alternative medication or reduce dosages. What are the side effects of Airomir? All medications have some side effects but not everyone experiences them. Common side effects may affect 1 in 10 people and rare side effects can occur in 1 in 1,000 people or 1 in 10,000 people in very rare cases. If you experience any side effects you should consult your GP straight away. You should also look out for signs of an allergic reaction as this will require immediate medical attention. If you have swelling of the lips, face or neck, you have difficulty breathing, a skin rash or hives you are experiencing an allergic reaction and should seek medical help right away. If Airomir is having no positive effect on your asthma and is worsening your condition rather than improving it, you should stop taking this medication. The active ingredient in Airomir, salbutamol, effectively opens up the airways allowing for easier breathing. It is an effective treatment for easing symptoms of asthma when they happen occasionally due to exercise or being exposed to a trigger. How to buy Airomir online? The most important thing to consider when buying medication online is safety. Doctor-4-U are regulated by the MHRA and the General Pharmaceutical Council. We put patient safety first and all of our online doctors are GMC registered. Buying Airomir online at Doctor-4-U is safe, fast, and convenient and involves simply ordering your prescription medication online through our website by submitting a medical consultation form with relevant details about your health, and this will then be reviewed by our doctors who will determine your suitability for this medication. If Airomir is suitable for you it will be dispensed at our UK-based pharmacy and delivered to you securely via a tracked courier service.